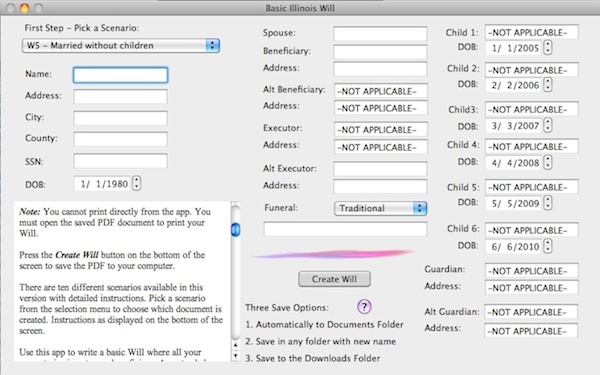 Create and print a PDF copy of your Will from the online legal office of Michael E. Byczek, Esq. (Chicago, IL). The document is displayed on screen in PDF format. All you need to do is open the document in Preview (via the OS icon). 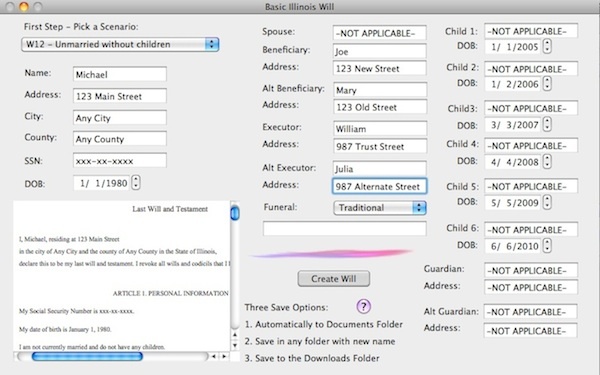 Just save or print the Will from within Preview. There are ten different scenarios available in this version with detailed instructions. Pick a scenario from the selection menu to choose which is created. 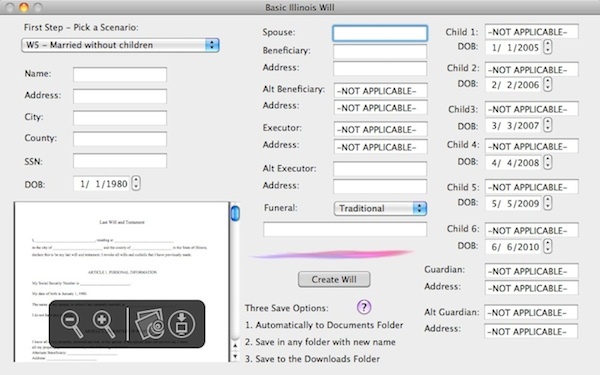 Use this app to write a basic Will where all your property is given to one beneficiary. An extended version is under development for itemized property distribution. 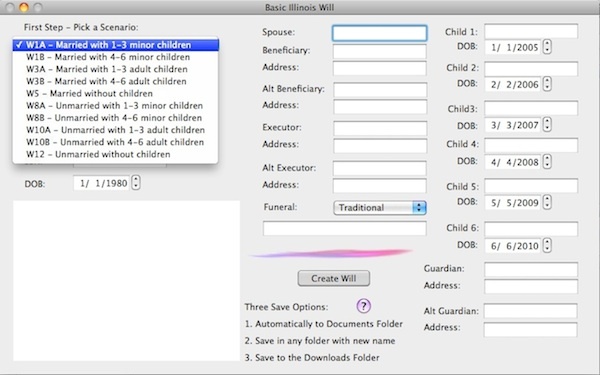 Based upon your marital status and number of children, the Will is either three or four pages. A one page affidavit is also included for you and two witnesses to notarize the Will. Each page (4 or 5 in total) should be notarized for authenticity. There are ten common scenarios available in this version that correspond to #W1A, W1B, W3A, W3B, W5, W8A, W8B, W10A, W10B, and W12 from the developer's online legal website. If you are married, your spouse is sole beneficiary and administrator of the estate. If you have minor children, he/she is also sole guardian. Pick one alternate administrator and guardian (if applicable). If you are not married, but have children, they are the sole beneficiaries (equally divided). If you have minor children, pick a primary and alternate guardian. If you are not married and do not have children, pick a primary and alternate beneficiary. The developer Michael E. Byczek is licensed to practice law in Illinois (app is valid for Illinois residents) and an Apple certified system administrator. Detailed information about each scenario is available from the developer's website.